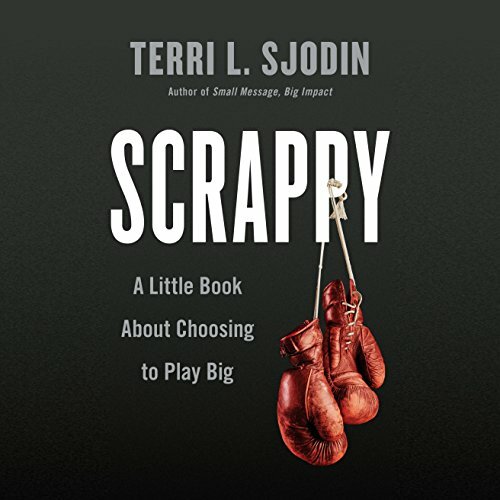 Scrappy: A Little Book About Choosing to Play Big by Penguin Audio at Spring Brook Audio. Hurry! Limited time offer. Offer valid only while supplies last. For those times when hard work and persistence just aren't enough, Terri Sjodin offers an inspiring guide to getting scrappy and beating the odds. It can seem like these successes are just one-off acts of ingenuity or isolated flashes of brilliance. But today it takes more than just creativity, more than just persistence, more than just a dream to reach big goals - it takes a mind-set and a strategy. Sjodin explains the common elements behind every successful scrappy effort. Drawing on research, interviews, and her own personal experience, she identifies the practices that will help you develop the right mind-set. She shares stories of scrappy tactics that have worked, and those that have crashed and burned, to help listeners pursue their own visions. Whether you're a sales rep looking to close that big deal, a job seeker trying to land your dream job, or a CEO who wants to reach the next level of success, the fastest way to get what you want is to get scrappy. View More In Systems & Planning.